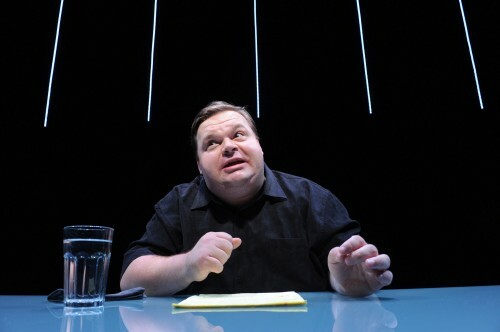 Mike Daisey, the famous-turned-infamous creator and star of The Agony and Ecstasy of Steve Jobs, has returned to Woolly Mammoth with his controversial production. The show – a monologue about all things Apple, including geekery, gadgets, and Chinese factories – inspired a national inquiry into Apple’s manufacturing process. It also caused a public outcry as his “work of nonfiction” was later revealed to be partly fiction. I didn’t want to bore you with the ugly details, because you’ve heard them already from former staffers at Woolly Mammoth, from NPR’s This American Life (TAL), and from Daisey himself. Instead, I headed over to Woolly Mammoth last week to see the show for a second time. Then I spoke with Mr. Daisey about coming back to our fair city and what he thinks of our very favorite thing: us.